TOKYO--(BUSINESS WIRE)--Toshiba Corporation (TOKYO:6502) today announced the launch of “TC7763WBG”, a wireless power receiver IC for mobile equipment that is compatible with the Qi1 standard defined by the Wireless Power Consortium (WPC). This includes smartphones and mobile accessories. The IC realizes a charging time equivalent to charging with a cable. Mass production shipments start today. Wireless charging allows adoption of an insulated case free of exposed charging ports, an advantage of that is stimulating demand for waterproof portable products, such as smartphones and wireless video game controllers. High power transmission is also required for wireless chargers to reduce charging time. “TC7763WBG” adopts optimized circuit design to increase maximum output power to 5 Watts, comparable with a cable, enhancing applicability. 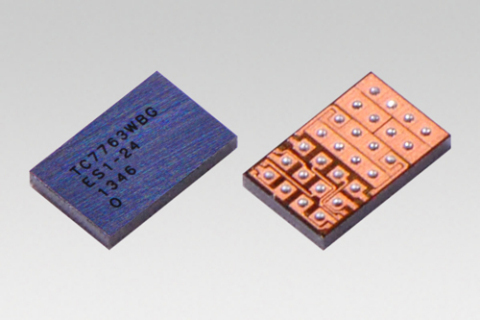 Toshiba is expanding its line-up of wireless power receiver IC. Supports foreign object detection (FOD) functions. Adopts compatible pin assignments with “TC7761WBG”, which supports maximum 3.5 Watts, allowing replacement without any need to change PCB design. 1. The international standard for inductive electrical power transfer over distances of up to 4 cm, defined by the Wireless Power Consortium. Toshiba starts mass production shipments of "TC7763WBG", a wireless power receiver IC. The IC realizes a charging time equivalent to charging with a cable.